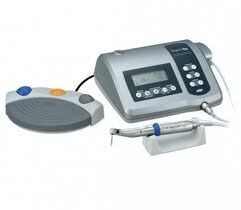 NSK Surgic XT Plus is available with and without fiber optic capability. Micromotor auto calibrates and synchronizes with the rotational resistance of each contra angle attached for safety and control. This electronic micro control provides a more consistent feel when switching between attachments with significantly different gearing. This calibration is important in ensuring torque accuracy for maximum patient safety with each operation. Powerful 210W hi-power brushless micromotor generates minimal noise and vibration. Brushless technology is an advancement which transfers energy with fewer components subject to failure. Speed control between 200 and 40,000 rpm is virtually limitless within its range. 8 User-programmable Presets allow for quick change over between uses. Foot control is smooth and allows constant speeds to be maintained.